The Luxury Collection is part of Marriott International and comprises 121 fine properties in 39 countries. Hungary does not have the fortune to house a Luxury Collection establishment but the 46 in Europe include neighbours and near-neighbours Austria with four and one each in the Czech Republic, Slovakia, Bulgaria and Poland. Italy is the best-represented country in Europe for Luxury Collection hotels, with eight, one more than in austerity-plagued Greece and double the four each in Austria, Spain, Portugal and the UK. 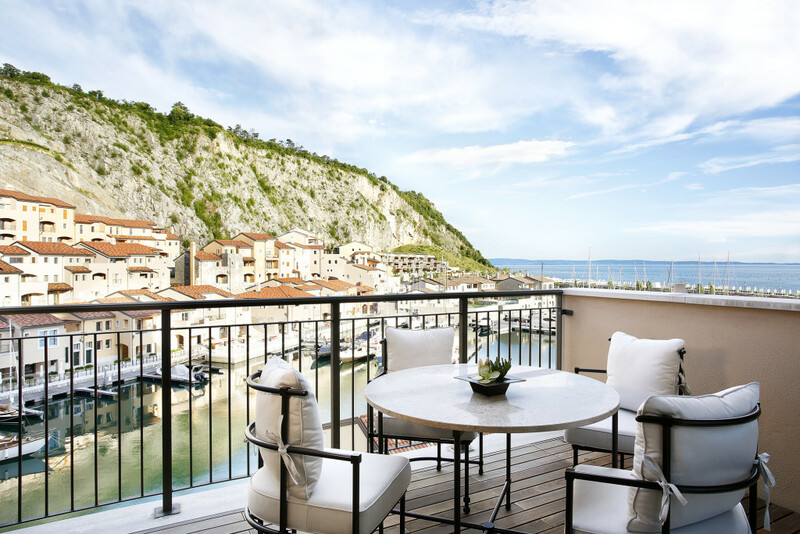 It was to Italy that The Budapest Times travelled recently, to sample the luxury of The Luxury Collection in Portopiccolo, on the north-east Italian coast. 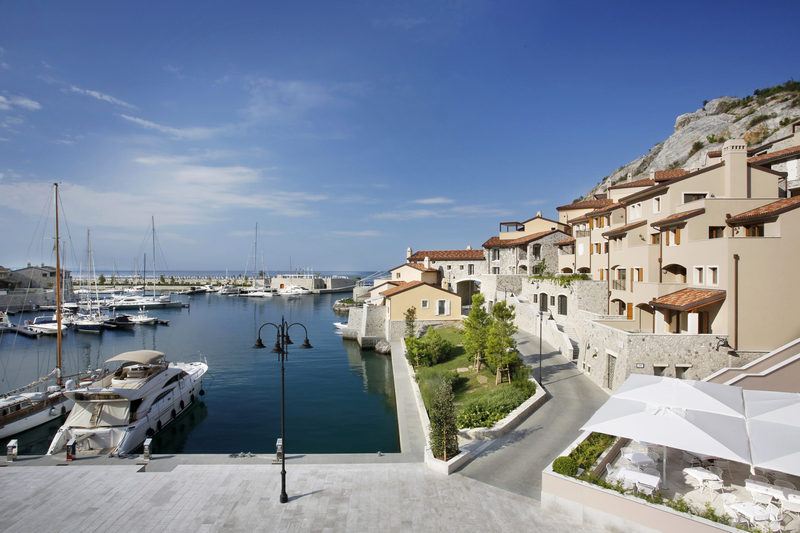 Portopiccolo (“Small port”) is a comfortable drive, straight down the mostly motorway through Hungary and spectacular Slovenia and then just 17 kilometres along the Gulf of Trieste. Here , near Sistiana, we find what turns out to be a natural inlet housing a private and exclusive beachfront complex that includes the Falisia Luxury Collection Resort & Spa fronting cascading terraces of 465 apartments and villas, for sale or rent. An automatic boom-gate records our entry and then cars are tucked away out of sight. Portopiccolo is a pedestrian-only, pollution-free resort with the hotel and a selection of chic restaurants, bars, boutiques and a bakery along two shopping streets with a waterside promenade. The whole faces the 121-berth marina of Portopiccolo Yacht Club with an expensive array of cruisers and yachts. The marina gives out to the Adriatic Sea, and over on the left horizon is the coast of Slovenia, and to the right the Italian coast heading down to Venice. This bay was a quarry until the 1970s, which explains the almost vertical rock face enveloping Portopiccolo. A real estate project to develop the abandoned area was born in the 1980s and construction on the resort began at the end of the 1990s. The attractive Mediterranean village of typical local stone started to operate in 2014 and the Falisia Luxury Collection Resort & Spa opened in July 2015. Its front door is a mere 20 metres from the marina, across the main square of the complex, and the hotel features 58 suites and rooms, all except five looking straight down onto the boats and Adriatic Sea from their own balconies. 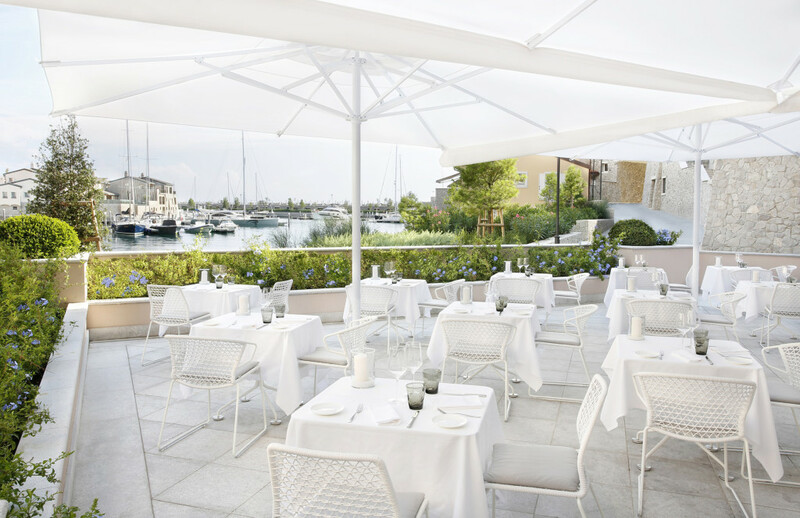 The Falisia also includes the gourmet restaurant “Cliff” and “La Piazzetta” lounge bar, both with al fresco terraces facing the marina. There is a dedicated wellness and fitness area within the hotel, and a private white shingle beach with beach club, outdoor pool and sun terrace. 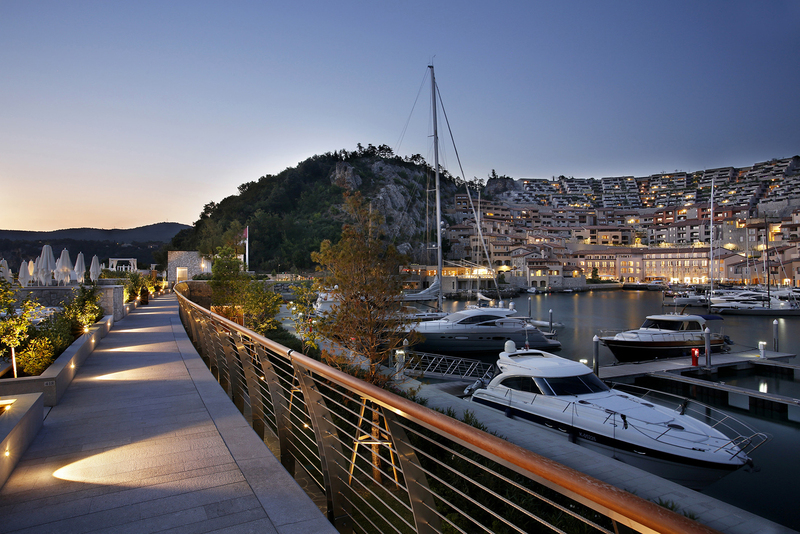 Conference facilities with the latest technology opened last December, and these were joined in April this year by the new 3600-square-metre beauty and wellness area Portopiccolo Spa by Bakel, five minutes walk from the Falisia. 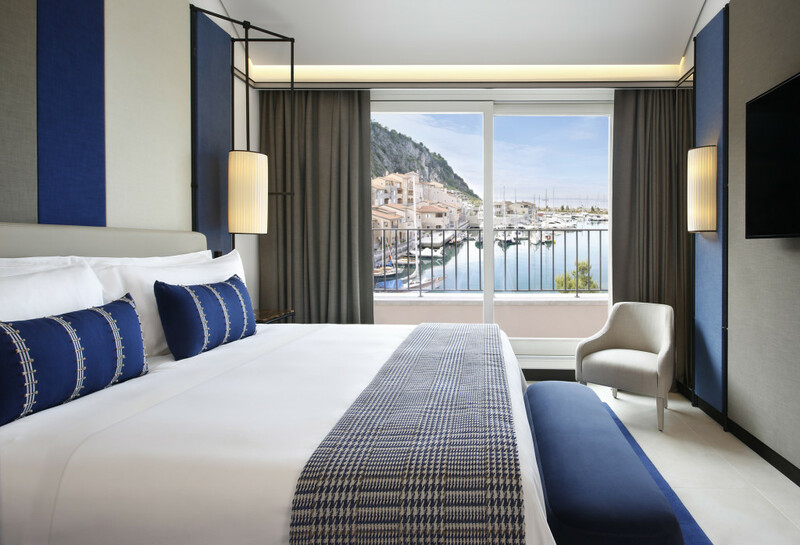 Of particular interest concerning The Luxury Collection is their declaration that each hotel and resort aims to be a unique expression of its location (what they themselves call “a portal to the destination’s indigenous charms and treasures”). All are said to be noteworthy for their history, architecture, art, furnishings and amenities, highlighting the rich culture of each property’s distinctive surroundings. Thus at the Falisia the guest rooms and suites feature a revised concept of the canopy bed to recall those past overlords of the area, the Habsburgs, and burnished metal elements and warm fabrics designed to be reminiscent of the elegant atmosphere of the cruise ships of the 1960s. The idea here is to reflect the maritime passion of this Italian region and the shipbuilding tradition of nearby Trieste. Talking about luxury, which we were, the five-star Falisia’s rooms include a large flat-screen TV, a safe, an Illy coffee machine and a sitting area, with marble surround for the bathroom sink, plus rain shower, bathtub and bidet, with bathrobes, slippers and Acqua di Parma toiletries. The gleaming Illy machines are another nod to Trieste, the port where coffee first entered Europe, and still does, and where in 1933 company founder Francesco Illy developed the modern espresso machine. Sitting on the terrace with a red wine from the surrounding Karst region, the sun is on the descent, the gulls are riding the air currents, boats of all sorts are passing on the Gulf and the temperature is just right. It is a blissful interlude of sun, sea and sky, with the feeling that it may always be June. All in all, it adds up to what is known as the lap of luxury.